site under construction. thank you for your patience. 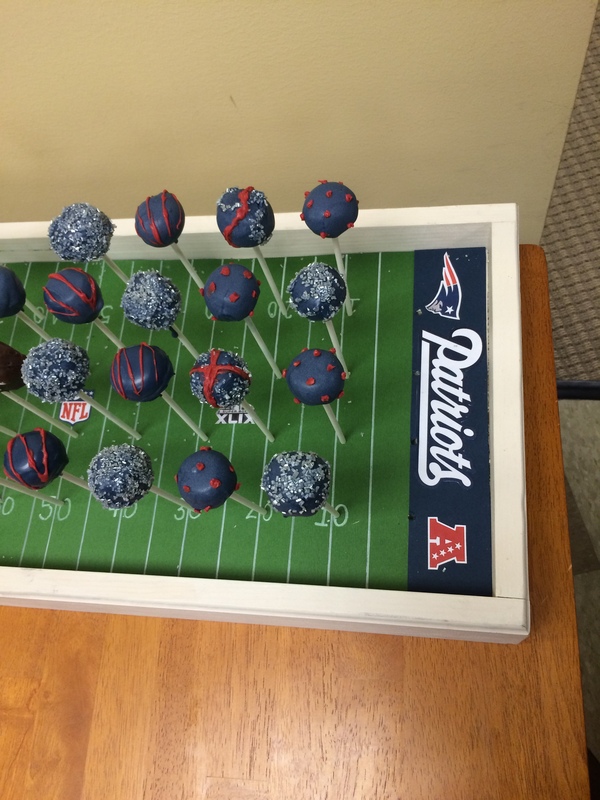 And how could I forget about my Super Bowl Cake Pops from last year?! Visit my Party Planning- Super Bowl Pinterest Page for more inspiration! I could have taken the easy way out…picked up my favorite Heath Bar crispy cookies from the local Fresh Market or asked my mom, a baker of 25+ years, for one of her pull apart football cupcake cakes. But NOOOOO… I had to go above and beyond. My college roommate introduced me to the wonderful world of cake pops and my life was forever changed. Every holiday or occasion I try to think of the most creative way to incorporate these delicious delicacies, so our Superbowl Tailgate Party Lunch at work was no different. Plus it was my first time to show all of my coworkers my creative skills. How did I do it? Well, let’s start with the cake pops. I couldn’t settle for just yellow or chocolate cake, of course… So I bought 1 box of Duncan Hines® Classic White Cake Mix and 1 container Duncan Hines® Creamy Home-Style Cream Cheese Frosting. I followed the simple directions and split the cake into to pans. I added green and yellow food coloring to one pan to create the perfect “action green” aka lime green for the Seattle Seahawks. Next I added red food coloring to the other pan to make a red cake for the New England Patriots. FAIL… it came out pink and I didn’t have enough time to learn how to create a red cake from scratch. I’ll get to plan B. I baked the green cake, waited for it to cool, crumbled it up, and added a little less than 1/2 of the frosting to create the perfect consistency. I even added some green and yellow food coloring to the frosting before mixing it with the cake. I wrapped the cake and put it in the fridge to cool for the night. Back to plan B… “MOM…” The next morning I called my mom, who was at work, and asked her to bring home some red velvet cake. When I got home from work, the cake was sitting on the counter waiting for me. I added another less than 1/2 of the frosting to the red cake, covered it, and stuck it in the freezer. I took the green cake mixture out of the fridge, molded balls about 1 inch thick, and stuck them in the freezer. It was time to repeat with the red cake mixture. While the balls were in the freezer, I melted the Wilton® Royal Blue Candy Melts and following the instructions on the bag. Luckily, both teams have grey/silver accent colors so I could use the same pearlized sugar. A little over a year ago, I had my ex-boyfriend create a wooden display that holds 44 sticks and I love it. I wish I saved the blog I got the idea from (sorry!). 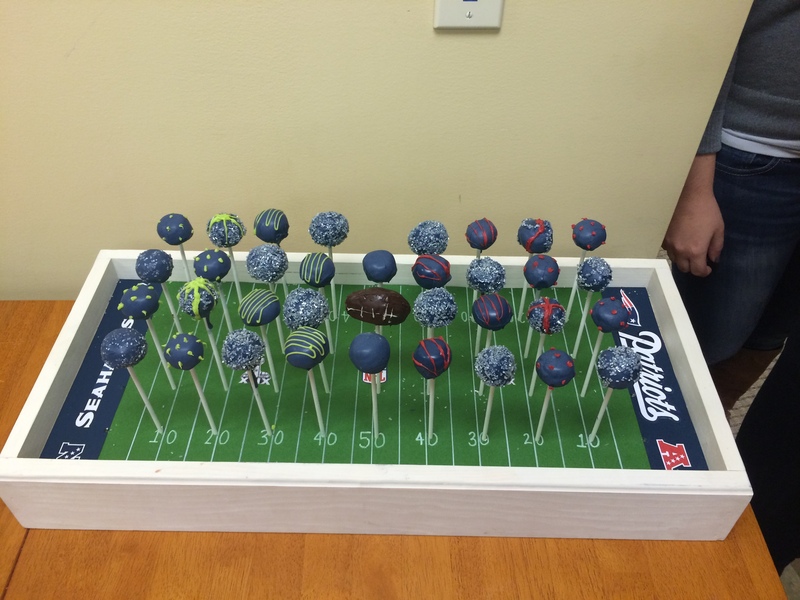 I wanted a creative way to display the cake pops, so I decided to decorate it like a football field! I printed all of the logos; Seahawks, Patriots, NFC, AFC, NFL, as well as the Super Bowl XLIX logo. I bought two pieces of green 12″x12″ cardstock paper and a Recollections™ Signature Opaque Marker (medium) from Michael’s. I already had a piece of blue card stock at home for the end zone. As I said, I know it isn’t perfect. But I tried! And everyone at work was very impressed. What did you make for Super Bowl XLIX?